Mr. Joe Nyal Tatum, age 89, went to be with our Heavenly Father on April 3, 2019 in Mercy Hospital, Springfield, Missouri. He was born, and raised, in Selmore, Missouri, on August 14, 1929, the son of Neal Glen and Zoe (Payne) Tatum. He was employed in law enforcement at the Sheriff’s Department for nearly 20 years. 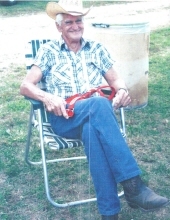 Joe was a member of numerous saddle clubs and horse showing associations. In 1986 Joe was united in marriage to Lenora Elizabeth Cox in Miami, Oklahoma, and they enjoyed 33 years together before his beloved wife recently passed away on March 9, 2019. Others who preceded Joe in death were a son, Dan Tatum; a grandson, Matthew Tatum; his parents; a brother, Keith Tatum; a sister, Yvonne, and a step great granddaughter, Sophie; and a great grandson, Ryan Parish. Survivors include his children and their spouses, Clint and Vicky Tatum of Reeds Spring, Rex and Teresa Tatum of Sparta, Lyle and Kelly Tatum of Billings, Kevin and Donna Stott of Ozark, and Teri Blevins of Highlandville; three step sons and their spouses, Howard and Janis Camron, of Galena, Dwight and Sheila Camron, of Clever, and Paul and Rita Camron of Clever; 17 grandchildren; 22 great grandchildren; three great-great grandchildren; and many cousins, nieces and nephews. To send flowers or a remembrance gift to the family of JOE NYAL TATUM, please visit our Tribute Store. "Email Address" would like to share the life celebration of JOE NYAL TATUM. Click on the "link" to go to share a favorite memory or leave a condolence message for the family.